In the New Horizons Mission Operations Center at the Johns Hopkins University Applied Physics Laboratory in Laurel, Maryland, flight controllers (from left) Chris Regan and Becca Sepan monitor data from NASA’s New Horizons spacecraft on June 30, after a short course-correction maneuver refined New Horizons path toward a flyby of Pluto on July 14. 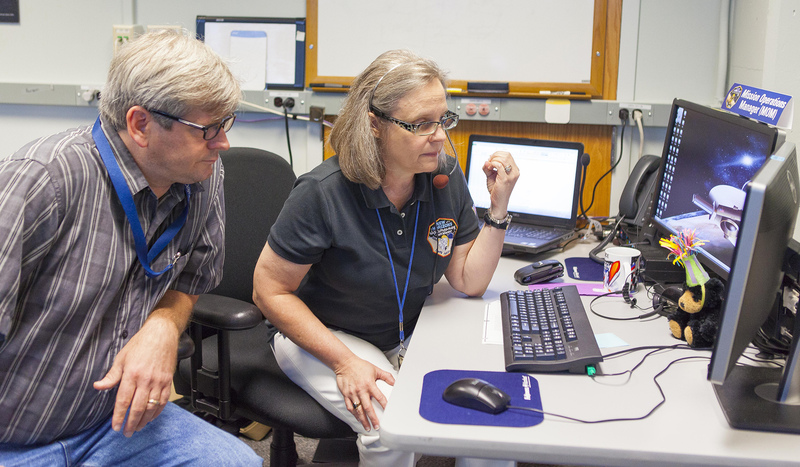 In the New Horizons Mission Operations Center at the Johns Hopkins University Applied Physics Laboratory in Laurel, Maryland, Mission Operations Manager Alice Bowman and operations team member Karl Whittenburg watch for data confirming that the Pluto-bound NASA spacecraft successfully executed a course correction maneuver on June 30. With just two weeks to go before its historic July 14 flight past Pluto, NASA’s New Horizons spacecraft tapped the accelerator late last night and tweaked its path toward the Pluto system. The 23-second thruster burst was the third and final planned targeting maneuver of New Horizons’ approach phase to Pluto; it was also the smallest of the nine course corrections since New Horizons launched in January 2006. It bumped the spacecraft’s velocity by just 27 centimeters per second – about one-half mile per hour – slightly adjusting its arrival time and position at a flyby close-approach target point approximately 7,750 miles (12,500 kilometers) above Pluto’s surface. While it may appear to be a minute adjustment for a spacecraft moving 32,500 miles per hour, the impact is significant. New Horizons Mission Design Lead Yanping Guo, of the Johns Hopkins Applied Physics Laboratory in Laurel, Maryland, says without the adjustment, New Horizons would have arrived 20 seconds late and 114 miles (184 kilometers) off-target from the spot where it will measure the properties of Pluto’s atmosphere. Those measurements depend on radio signals being sent from Earth to New Horizons at precise times as the spacecraft flies through the shadows of Pluto and Pluto’s largest moon, Charon. In fact, timing and accuracy are critical for all New Horizons flyby observations, since those commands are stored in the spacecraft’s computers and programmed to “execute” at exact times. This latest shift was based on radio-tracking data on the spacecraft and range-to-Pluto measurements made by optical-navigation imaging of the Pluto system taken by New Horizons in recent weeks. Using commands transmitted to the spacecraft on June 28, the thrusters began firing at 11:01 p.m. EDT on June 29 and stopped 23 seconds later. 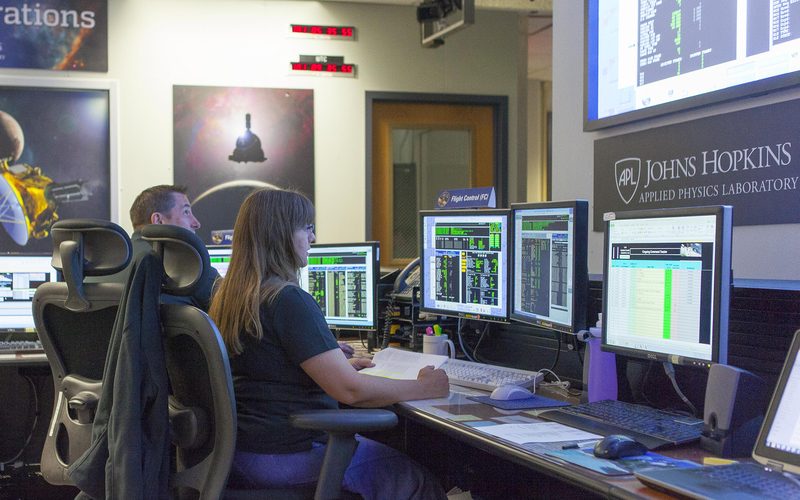 Telemetry indicating the spacecraft was healthy and that the maneuver went as designed began reaching the New Horizons Mission Operations Center at APL, through NASA’s Deep Space Network at 5:30 a.m. EDT on June 30.